After a great season and promising run for the NCAA championship Jimmer Fredette has taken the country by storm. In the past week alone, Fredette has received three major player awards: The Naismith Player of the Year, The Associated Press' National Player of the Year, and the 2010-11 winner of the Lowe's Senior Class Award in men's basketball. The Lowe's Award is chosen by a nationwide vote, which includes head coaches, national media and even fans. To be eligible, the student-athlete must be a senior and have notable achievements in four areas of excellence -- community, classroom, character and competition. Fredette won the award by an overwhelming majority, with 49 out of 65 head coaches voting for Fredette! 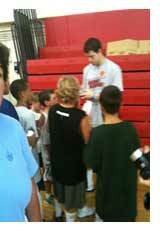 People just can't get enough of the hometown hoops star! In recent months, Fredette has scored the cover of Sports Illustrated Magazine and is the star of a viral YouTube video, "Teach Me How to Jimmer." As Fredette's college career comes to an end, we wonder what accomplishments he will achieve at the professional basketball level and what the future will hold for him?